Buzz Aldrin shares personal stories and advice in his new book "No Dream Is Too High: Life Lessons from a Man Who Walked on the Moon" (National Geographic Books, 2016). Moonwalker Buzz Aldrin has learned a lot over the course of his long, eventful and complicated life, and he's sharing some of the most important lessons in a new book. 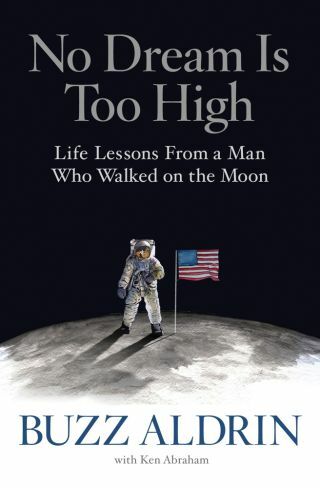 In "No Dream Is Too High: Life Lessons from a Man Who Walked on the Moon" (National Geographic Books, 2016), Aldrin talks about the historic highs he has experienced (becoming the second person ever to set foot on the moon, for example) as well as the soul-trying lows (recurring battles with alcoholism and depression). "Fate has ordained that the men who went to the moon to explore in peace will stay on the moon to rest in peace," the speech began, according to the new book. "These brave men, Neil Armstrong and Edwin Aldrin, know that there is no hope for their recovery. But they also know that there is hope for mankind in their sacrifice. These two men are laying down their lives in mankind's most noble goal: the search for truth and understanding." There's more to the speech, including these lines: "Others will follow, and surely find their way home. Man's search will not be denied. But these men were the first, and they will remain the foremost in our hearts." "No Dream Is Too High" is an inspirational book aimed at people of all walks of life. But Buzz Aldrin hopes that some of the folks who read it will be in a position to help humanity push its footprint out into the solar system, all the way to Mars. Indeed, Mars colonization is a big priority for Aldrin. He published two books on the topic recently: "Mission to Mars: My Vision for Space Exploration" (National Geographic Books, 2013) and "Welcome to Mars: Making a Home on the Red Planet" (National Geographic Children's Books, 2015), which was written for younger readers. "I hope that my ideas will motivate the space program people, and we'll see how this will promote international cooperation, which should really take place," Aldrin told Space.com. "No Dream Is Too High" by Buzz Aldrin is available on Amazon and was released on April 5.